As a mechanical engineering undergraduate at Northwestern, John Stroup endured a dynamics course—and in the process, experienced a personal awakening. Until that point in Stroup’s academic life, the Minnesota native admits that classwork had come rather easy. The dynamics course’s formidable content coupled with an unapologetically tough professor, however, left Stroup feeling intimidated and unsettled. “I had to push myself to an entirely new level,” he says. “I had no other option.” Having survived the dynamics course, Stroup emerged empowered and confident and took with him memories that strengthened his resolve and energized his future. 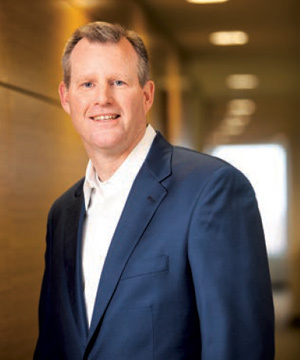 A case in point is Stroup’s last dozen years as CEO of Belden, a 103-year-old, St. Louis-based company specializing in end-to-end signal transmission solutions. When he arrived at Belden in 2005, about 90 percent of its revenue derived from simple, passive products, like industrial cable. In addition, its service area was confined primarily to the United States and to Western Europe, a region where financial performance had chronically languished in the red. Stroup quarterbacked Belden’s 21st century transformation, expanding its global footprint and its product portfolio into connectivity, networking, and cybersecurity in response to the world’s insatiable and ever-growing appetite for data. As a result, Belden’s earnings have increased seven-fold since 2005. With more than 8,400 employees worldwide, Belden now serves any entity—from television networks and manufacturing facilities to healthcare institutions, universities, and more—that needs hardware and software solutions to tie its technology together. Stroup says that he has leaned on his Northwestern education as he’s met the wide-ranging challenges facing him as CEO, from communicating about product development with Belden engineers in Germany to wooing a large broadcast customer in China to strategizing with his company’s cybersecurity team in Oregon.